What do you call the looming spirits, teeming with unbridled creativity, and are travelling at speed of 60 minutes per area? The 2017 Writivism anthology is the hub of processing adrenalin in the mind’s eye and houses these 7 gifted writers who mercilessly murder and execute great quality writings in a collection of short stories. Our role as readers is to detect mysteries put forth by them and get more acquainted with the many little corners around the world. Eboka C Peter kickstarts the journey and like he says, you will most probably “delight at his grasp of a word lumbar?” Peter, (as you may observe we are now on a first name basis) because we readers are the team and teamwork makes the dream work. He indulges in secrets of being content in various facets of life. In another short story, he aptly shares about a common fear of budding writers grapple with. This is a story of becoming Nakobov. Let’s pause for a while. Let me ask, are you sure you are supposed to be here? Your eyes are lurking on this post and have stumbled upon the title of one of Jennifer E Chinenye short stores. Do you know the captivating cycle of how strangers become friends and friends become family? Jennifer shares how a love twist of one man who was once a stranger and now a father to the main character and demonstrates his love with her by laying with her for as long as she is unmarried. That is how daughters become lovers. In another story, when brothers become sons, Jennifer voices out a sibling reality of silent envy and careless freedom; as one brother defies all odds to pursue his film making dream and the other is left to live in his brother’s shadow. Is this not a tragedy or a mystery? Charles King like his name suggests, dashes royalty metaphorically as he shares about the two pink stripes that are knocking at his door. Alas! It’s the most popular neighbors on his street; HIV/AIDS. He is invited to sit for a test that will change his life and is afraid of hearing the results just when life presents him many lemons to make much more lemonade. Karen Mukwasi takes us on the journey of black girls leaving the white lie in her short story. This encompasses the reality of light skin made up of Chinese tones and shades of yellow fever syndrome are becoming the order of the day. The lightening creams make crazy sales and shows the sad discovery on how quantity trumps quality. On a lighter note, Winnie Cherop is tipping us with the truth we have been waiting for. Coconuts and mangoes are the fleshiest of fleshy fruits. The truth is that mangoes are sweeter and more popular. The coconuts on the other hand are plain heads, usually nerds that receive less attention in life until reality checks hit and loyally pay lump sums of regret to the persons that preferred the former. The beauty of life is growing consistently. Vivian Ogbonna gives the juicy details in her short story “looking for the badge of honour”. She invites us to explore Accra in Ghana in five days as a budding relative attending a writing workshop. Have you ever been love struck? Yvette Tetteh answers this question is an engaging short story by giving a remarkable guide to losing love. I must warn you she will leave all your heart strings plucked as you read about the man that runs with her heart. 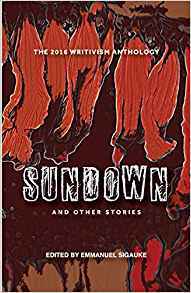 Overall, you should get your hands on this anthology. The language has been carefully selected to tickle your funny bones and connect in various aspects as Africans. The connection in our diversity is true beauty and this is what the Writivism truly anthology envelopes. Editor’s Note: Sooo Many Stories’ adult bookclub #MeIRead will be discussing Daughters who Become Lovers on Tuesday 16th May, 2017 at Kahwa2Go in Ntinda, Kampala and Tuesday 23rd May, 2017 at Village Mall, Bugolobi Kampala. Daughters who Become Lovers is available for download here on Afridiaspora.